When you walk into Albion College director of choral activities Clayton Parr’s office one of the most noticeable features is the large Georgian poster hanging on the wall behind his desk. It’s from his time in an American choral group that spent two weeks traveling throughout the country of Georgia, learning and then performing traditional Georgian folk music and American gospels. Georgia, a country between Russia and Turkey, became independent from the Soviet Union in 1991, but the republic dates back for centuries and boasts a rich, proud history. Parr explained that he sees Georgia as a “second home” to him, after the time he spent there under a Fulbright Scholarship from 2005 to 2006 at the Tbilisi State Conservatoire. A two-week choral performance trip during his Fulbright venture was why he was excited to incorporate the Georgian concert into this year’s endowed Strickler Concert. Named after former Albion College professor Dave Strickler, the endowed concert seeks to bring in different guest artists each year to perform at Albion College. Parr explained that this festival was something that he had been hoping to get together for some time because he felt that exposing more of the community to Georgian folk music is important. “We’re trying to get the word out. It’s folk music Evangelism,” he said, laughing. The Georgian “festival” that took place from March 14 to 16 was close to Parr’s heart. It included a Georgian-themed concert by the Briton Singers and the Concert Choir, with guest artists Trio Kavkasia, a U.S. band performing traditional Georgian music, and the Alioni Georgian Choir of Chicago. The weekend festival concluded with the Trio Kavkasia offering a free public choral workshop on and a presentation from former Georgian ambassador Ian Kelley. Kelley spoke about the current state of Georgian politics in relation to the US and Russia. 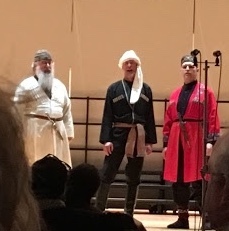 Parr, Trio Kavkasia and the Georgian Choir all wore traditional garb for the performance. Parr explained that he also personally finds the music fascinating. Parr explained that he finds Georgian folk music interesting for its application in choral music because it is one of the few countries that arranges folk music in a three-part harmony from the beginning, rather than asking choir directors to rearrange the music themselves. Parr has a unique connection to Trio Kavkasia that ultimately lead to the group coming to Albion. Parr first met Carl Linich, one of the Trio’s members, in Georgia after spending some time a conservatory. Linich also taught a summer singing camp in Georgia which Parr attended with a group of Americans who traveled through Georgia for two weeks. 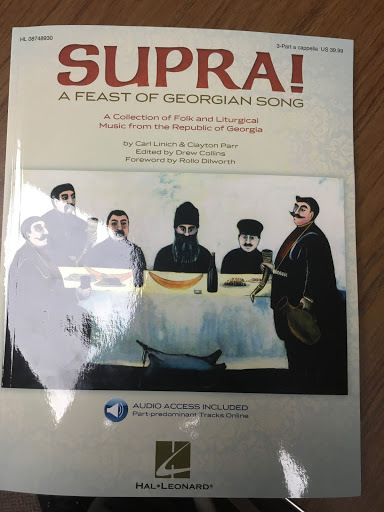 Since then, Parr and Linich have worked to bring more awareness to Georgian folk music, and have co-authored a book together, called “SUPRA!,” which is a collection of 18 Georgian folk songs. “They’re some of the best interpreters that we could get without actually flying someone in from Georgia,” said Parr. Trio celebrated its 25th anniversary this year, and has won awards including the Silver Medal from the Georgian Ministry of Culture for spreading the culture of Georgia. Its members came to Albion from New York, New Mexico and Canada to rehearse and to help workshop the Concert Choir and Briton Singers on Georgian music. The concert also included a performance from the Alioni Georgian Choir of Chicago, a nine-person ensemble founded in 2008. The group’s founding purpose was to research and share Georgian folk music with a larger audience through performance and teaching. Many of its members have traveled to Georgia to learn under the local singers there. The festival was in preparation for another event that Parr pulled together. At the beginning of the summer, 14 members of the Briton Singers will travel to the Republic of Georgia for two weeks to perform in the Tbilisi International Choral Festival. They’ll also complete residencies with local singers across the country. Briton Singers were so excited about the pieces they performed that Parr asked them if they were interested in traveling to Georgia during the summer. 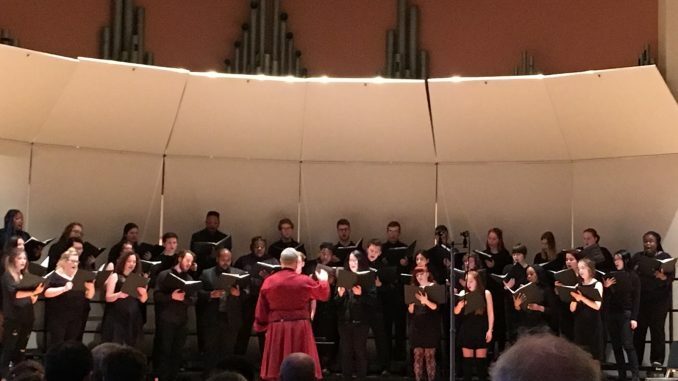 Parr explained that the tour will include a performance with choirs from around the world, but he believes that the Briton Singers will be the only American choir to perform. The Briton Singers will also travel out to more rural areas of the country to study under local singing masters. The trip will include a performance at the QSI International School, an English-speaking school for immigrant children in Georgia. Parr‘s children went to school there while he was teaching at Tbilisi for a year on the Fulbright grant. Parr studied the music and worked as a faculty member at the Tbilisi Conservatory. Adriana Cazzell, a sophomore from Dover, Delaware, is one of the Briton Singers traveling to Georgia this summer. She’s excited to leave the country for the first time. She is also excited to learn more about the culture and perform with other Georgian choirs. “They have been exceptionally wonderful with helping us work on our Georgian pronunciation and music. I am very grateful to have had the opportunity to work with such an accomplished group of men,” said Cazzell. Philip Meyer, a senior from Lake Orion, Michigan, and another member of Briton Singers, is also grateful for the opportunity. He explained that he is so drawn to Georgian folk music because of its three-part group singing, and embrace of the human experience.